As much as we wish it were true, new features don't get adopted by users without a little help. Scott Seiffer knows this. He helps communicate new features and drive their adoption at Indiegogo. 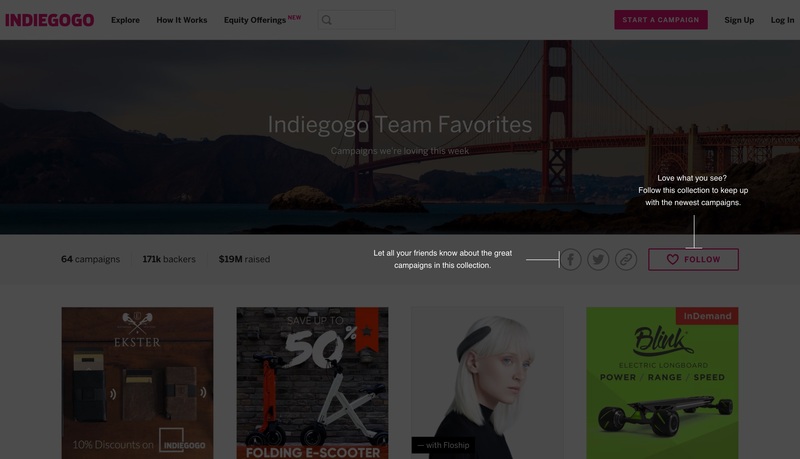 If you don’t know Indiegogo, they help match creative entrepreneurs in need of financial backing with a community of enthusiasts interested in backing projects. And if you've never visited their marketplace, it's definitely browse-worthy. Before using Appcues, Scott and his team at Indiegogo were communicating product updates in-app by hand. He would write some copy and pass it off to design. Design would create a spec and send it off to dev. Dev would then publish an in-app message into production. And only after all of this process—that took days or even weeks—would they find out if the in-app message was effective or not in increasing new feature activation. Appcues makes it easy for Scott to publish new feature announcements into the Indiegogo product without going through his development team. His developers did help him get set up using Appcues by installing the Appcues embed script into the Indiegogo website. And his design team helped style their flows to match the Indiegogo brand. After the initial set-up, Scott is now free to publish into his product whenever he needs without the help of either party. Scott and his team first launched Collections with a simple blog post. They let it run this way for a month or two, and saw little adoption to the feature. Knowing the feature’s importance, Scott turned to Appcues to point out a few key elements of Collections. Scott used Appcues’ coach marks to call out its share and follow buttons—the buttons which facilitate an increase in engagement. Scott’s enthusiasm for Appcues and what it is doing for him is contagious. We’re super excited to have him in the Appcues community.